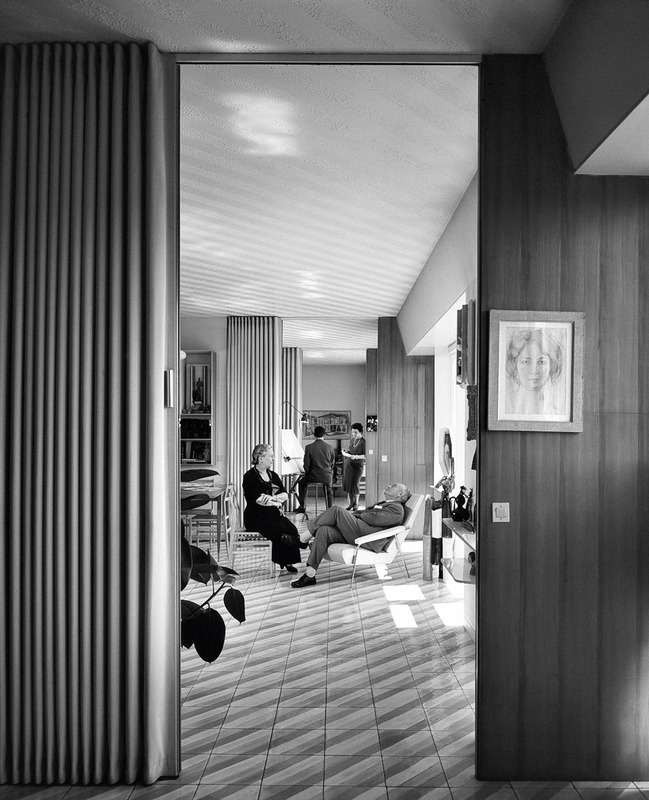 Gio Ponti is a modernist master, and certainly the most famous Italian architect. He was involved in the Novecento art movement and, in 1928, founded Domus magazine, the bible of architecture. However, he is less recognized for his innovative furniture design, which was an essential part of his perfectionist aesthetic. Luckily, the manufacturer Molteni has reissued several of his pieces for its Heritage Collection. Gio Ponti wanted to be a painter. Instead, to calm his parents’ nervousness about a son they considered fragile — yet who was everything but — he trained as an architect. His first job was as artistic director of the Richard-Ginori ceramics factory, where he worked from 1923 to ’30. There, he began to reveal his talent as a jack-of-all-trades and master of many. He designed Majolica vases, porcelain, sinks, and toilets, a line of furnishings for the Rinascente department stores called Domus Nova, and flatware for Reed & Barton, which used a crystal-like diamond pattern that would later reappear in furniture, building façades, and carpets. In 1928, Ponti founded Domus magazine and remained its editor-in-chief until ’41. He edited Stile magazine from 1942 to ’47 and returned the following year to Domus, where he remained until his death. (A domus was an ordinary Roman dwelling.) Through Domus, in the late ’20s, he became involved with the Novecento art movement, created in 1922 in support of Benito Mussolini’s Fascism, which favored classical Italian art. Painters Giorgio de Chirico and Giorgio Morandi were among its members, as were many World War I veterans, including Ponti, who’d served from 1916 to ’18, receiving the Bronze Medal and the Italian Military Cross and rising to the rank of captain. Ponti was more artistic than political, though this, of course, was a time when politics was a matter of survival. Ultimately, Ponti wanted to bring life into Italian design, and he was sought after by the group for his patriotic fervor. In 1931, he created the Bilia lamp, a sphere mounted on a metallic cone, which looked both classical and modern. He based his design for the interior rotunda of the Italian pavilion at the 1932 Venice Biennale on the Pantheon in Rome, adding modern styling to a classical icon. His only building in Rome, the mathematics department at the University of Rome (1934), was also his only one to incorporate a rationalist plan and Fascist-style front door. The Novecento group began to distance itself from the dictator’s anti-Semitic ordinances of 1938, and soon after fell apart. Ponti was in every way different from the rest of them. As an artist, he appreciated the beauty of simplicity. As an architect, he understood the value of elegance and function in space. He created the blueprint for an eclectic, idiosyncratic Italian lifestyle that was chic, functional, and industrially produced. To do that, he took on building and home design from outside to inside. 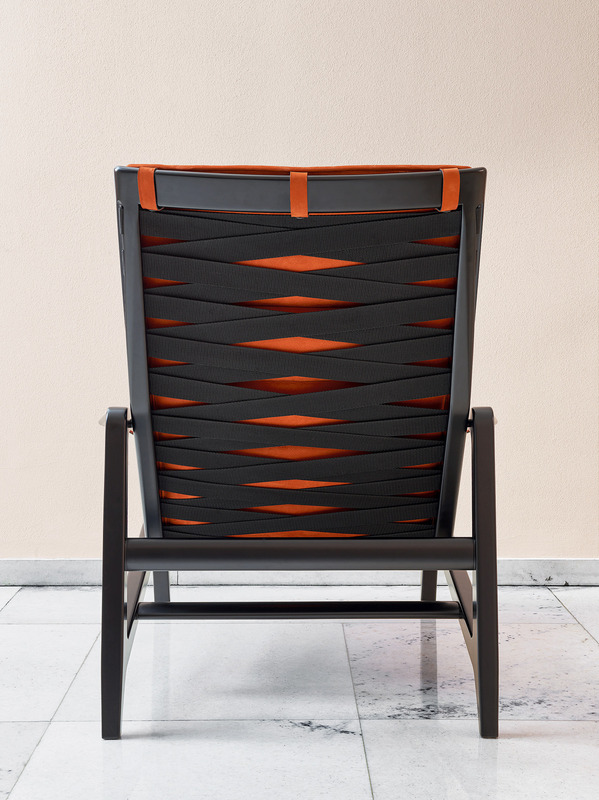 Ponti had been born into a world where furniture was designed and crafted by hand. In the early days of modernism, mass-market furnishings were manufactured by machine, sometimes using cast-iron molding. But these pieces were often bulky and heavy, and lacked the sophistication of handcrafted objects. Ponti became a pioneer in the use of lighter and more practical industrial materials, such as aluminum, which was then becoming more widely available. He saw furniture as functional art and focused on every detail, creating sleek, simple, elegant objects that could be mass-produced and looked unlike anything from the past. He devised building exteriors as giant geometric patterns over structures that were influenced by Andrea Palladio’s 16th-century villas as well as modern streamlining. He based his iconic 127-meter-tall Pirelli Tower in Milan (1956), at the time Europe’s tallest building, on a six-sided diamond shape, the motif he used in the flatware mentioned above, in the stairwell of the mathematics building in Rome, and under his glass-topped tables. The Pirelli Tower brought him international commissions in Caracas, Baghdad, Hong Kong, Tehran, Eindhoven, and Denver, as well as the opportunity to design a series of churches in Milan. 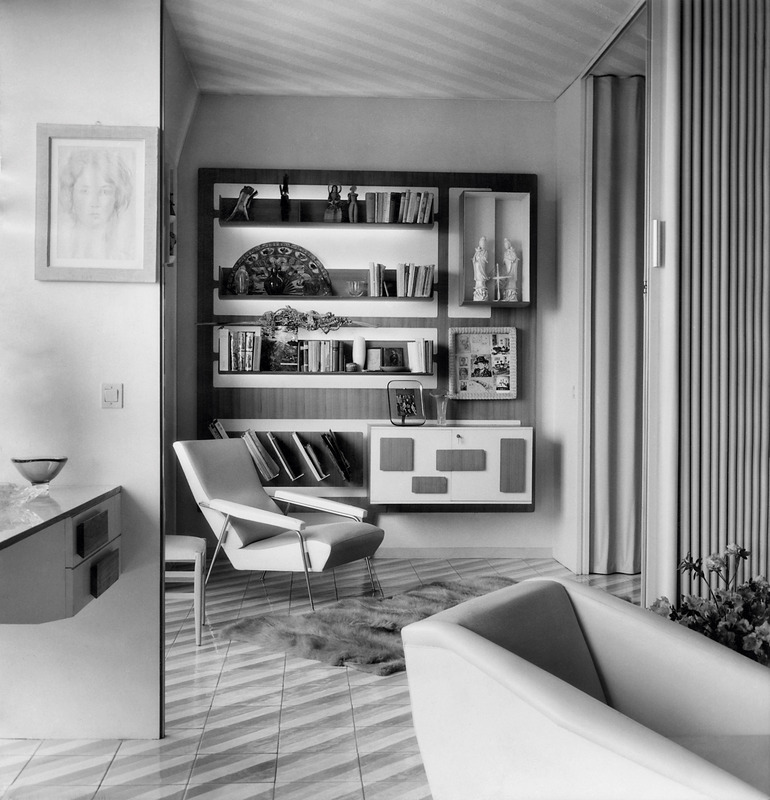 Ponti’s holistically conceived houses had sliding partitions and modular chairs, cabinets, and tables. He made desks, chandeliers, bedroom furniture, flatware, vases, and rugs with the same attention to composition as his buildings. His side tables and three-legged coffee tables had transparent tops and rounded corners, all the better to create airier interiors. A Ponti lamp did not simply light the room; it was an objet d’art. 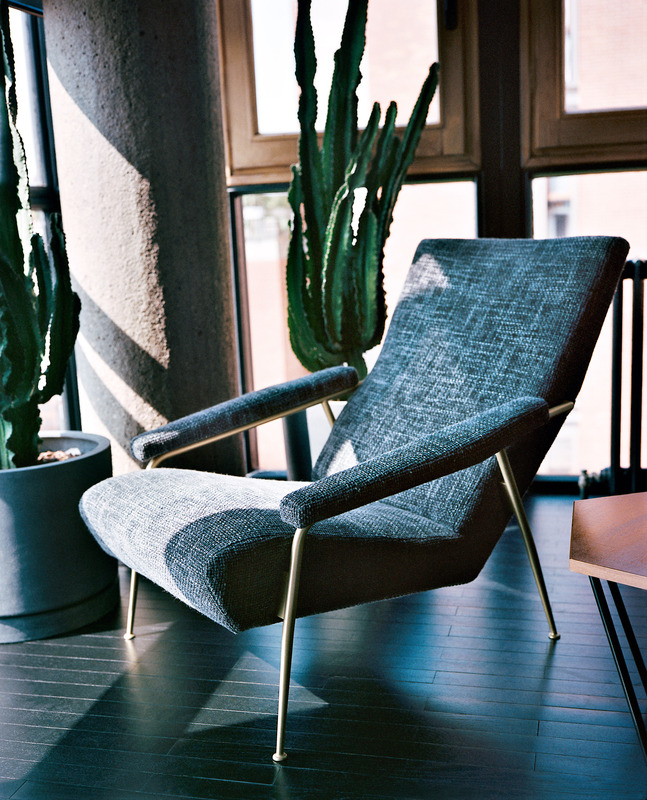 His 1953 Distex lounge chair, with a kind of inverted trapezoid shape, melded comfort with essentialist design. His curvaceously iconic La Cornuta espresso machine of 1948 and his ultra-light 1957 Superleggera chair changed seating and café society — which Fellini made fun of in his 1960 film La Dolce Vita. Ponti, who had the dapper look of an Italian movie star, could almost have starred in it. he made thousands of works. At his office, a giant converted garage, his assistants rode to their desks on Italian scooters, as if in a Fellini film. 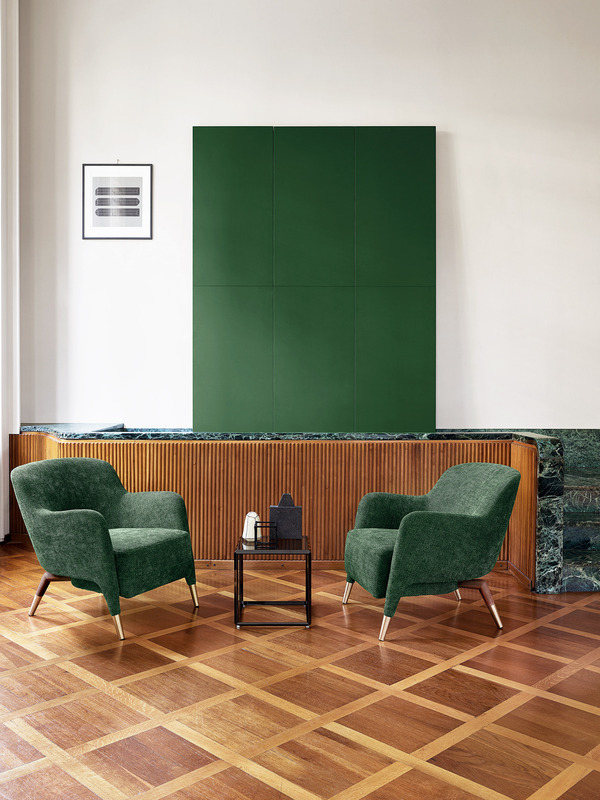 Several of Ponti’s armchairs, easy chairs, modular chests, cabinets, bookcases, and a rug are now being reissued by Italian furniture manufacturer Molteni&C. He designed one of the them, his well-known Via Dezza chair, for his family home at 49 via Dezza, a building he had also designed. 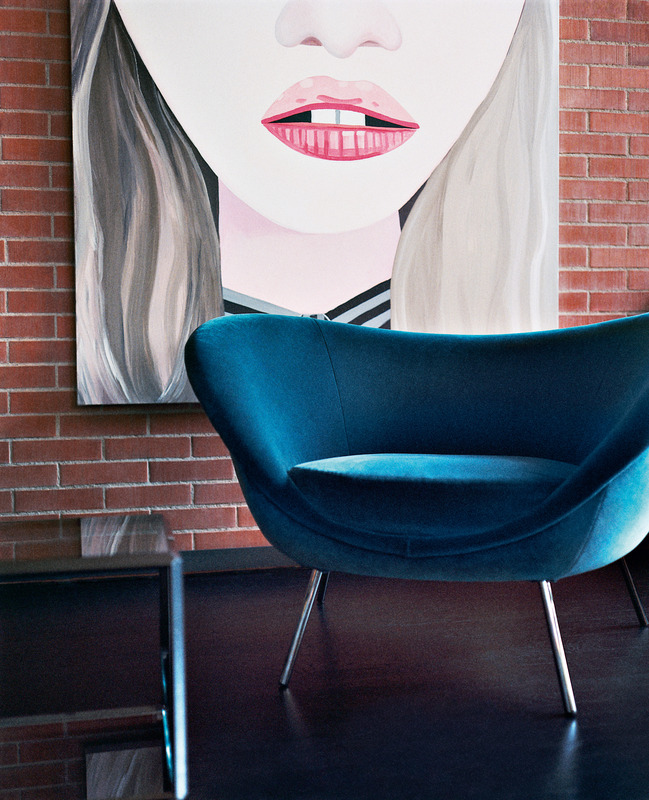 The chair now comes in a choice of two different velvet fabrics, which were also his creations. Widely admired for his kindness, Ponti was a true explorer of life and style. When he died in 1979 at the age of 87, his daughter claimed he could do 60 hours of work in a single day.